I think if I wasnt a Muslim, i would be vegetarian, Islam enourages to eat what is lawful and for us that is meat, but whats also lawful and good for us too is vegetables. I love vegetables, I love how they make ever meal more interesting and not to mention colourful.. and I never say no to a vegetable. I decided to try something other than meat and bachamel lasagna which oh soooooo good but oh so calorielicious. lol. 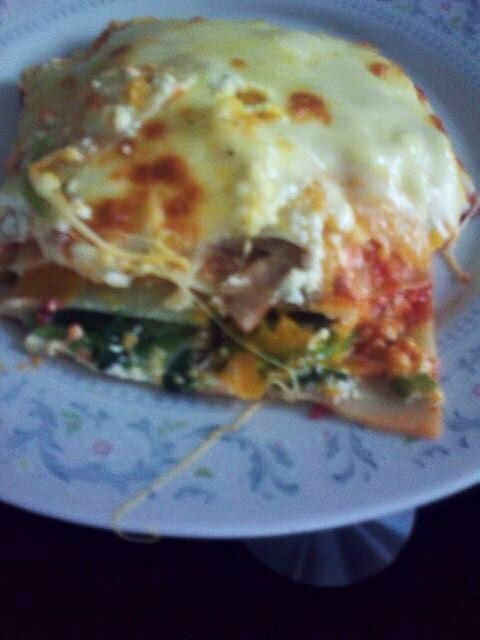 Heres my version of vegetarian lasagna. 1. boil diced pumkin for 20 minutes. Drain place in bowl and mash lighlty. add salt and pepper. Set aside. 2. saute some spinach with half the diced onion and salt and pepper. If theres any juices drain. 3. saute mushrooms with the rest of the onion with salt and pepper. set aside. 4. In a bowl combine ricotta cheese, egg, italian herbs, some mozerella cheese, and salt and pepper. set aside. 5. Take a rectangle baking dish and begin layering by putting some sauce down the bottom, a layer of lasagna, sauce and then ricotta cheese followed by spinach. Then a layer of lasagna, sauce, ricotta, then mushrooms, then a layer of lasagna, sauce, pumkin and keep repeating until you run out of fillings but remember you have to put a layer of sauce on top of each lasagna to help it cook. the final layer top off with sauce then plenty of mozeralla cheese. (my favourite). add some parmesan if you have some and then cover with foil and bake for 40 minutes, uncovered 10 minutes or until cheese forms a light crust. Serve with garlic bread and salad. Perfect! Yum! Hope to try this one soon but minus the pumpkin for me lol.